Pro Tour-San Juan has concluded and the winner is Paulo Vitor Damo da Rosa behind the strength of a strong top 8 draft and his RUG deck. You can find full coverage of the event here. RUG was a force for this pro-tour and it captured a number of victories in the block constructed portion of the tournament. It took several players to day two and it took 2 players to the top 8 draft. The deck combines mana acceleration with the most powerful card in the format: Jace, the Mind Sculptor. 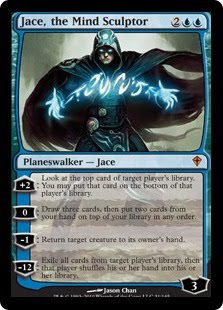 An early Jace can take over the game with library manipulation and card draw setting up removal and permission before building up the mana base to drop finishing bombs like Sphinx of Lost Truths or an Avenger of Zendikar. Congratulations to Paulo Vitor Damo da Rosa and rest of the finalists at Pro Tour-San Juan! I've been playing some games with Sister's of Battle recently and have had some fun putting together lists of varying point levels. I think they are a very powerful army, especially considering how old their codex is. Most of the codex has a number of problems with it: Antiquated vehicle costs or just plain bad units. But there are enough powerful units at the core and a lot of ways to maximize power levels in a sisters army by clever use of allies. One issue that this army has is a notable lack of long reliable long range shooting outside of the heavy slot. Enter an Imperial Guard platoon with heavy weapon squads and the issue is resolved. Here is what I've put together for 1500 points. This list maximizes allies to their full advantage. 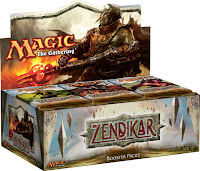 We use the Inquisitor and mystics to foil deep strikes into our lines. At 35 points they are a bargain. I take the IG platoon to leverage cheap chimeras and autocannon teams. Then I give the chimeras to the inquisitorial stormtroopers to go find objectives. The guardsmen will shoot from on foot, ideally in cover. Then we fill up with as many vehicles as possible. I'm a fan of exorcists for the fire support option they provide, especially at lower point levels where they prove extremely resilient. They do a decent job of tagging vehicles and are especially destructive against open topped transports and monstrous creatures. Some people prefer immolators in this slot and I don't hate the idea, but I think immolator spam is probably a better choice at the higher point levels, especially for 'Ard boyz as I've documented here. Celestians are the most powerful sister in the codex. They are automatically faithful and possess holy hatred so we use them whenever possible. Immolators are also very cheap and a very strong transport that doubles as an attack vehicle. The small units involved here and automatic faith points without the use of a veteran let us leverage some faith powers. The most notable is the ability which allows you to replace your celestian armor saves with an invulnerable. The increased initiative option in close combat can also be useful. Note I've given the stormtroopers plasma to fill a void that sisters cannot use the technology. We have a number of meltas under the use of adeptas sororitas however. At 2000 points we finish up the fast attack FO with additional dominion squads, we also give the Palatine an inferno pistol. Now the list has 13 melta and 6 immolators. I'm least interested in this army at 2000 points because I think the exorcists start to fade as the best possible heavy choice. But I still think it's viable. They can't take over the game like they can at 1500 though. Sisters tends to be a bit spammy in order to be competitive. Hopefully this will change with an updated Codex. In the meantime though, despite being a bit redundant the army is very good. It has all the tools required for 5th edition. Lots of efficient transports and the means to destroy enemy vehicles efficiently. 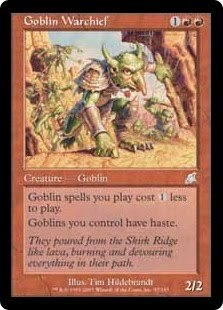 I've been messing around with my Ice Age block decks with my patient circle of Magic: The Gathering playing co-workers and doing round robin's for our block decks. You can view the decks here and here. I'm pretty happy with all of my deck's play but I find the mono-black Necropotence deck slightly wanting in some of the match-ups. 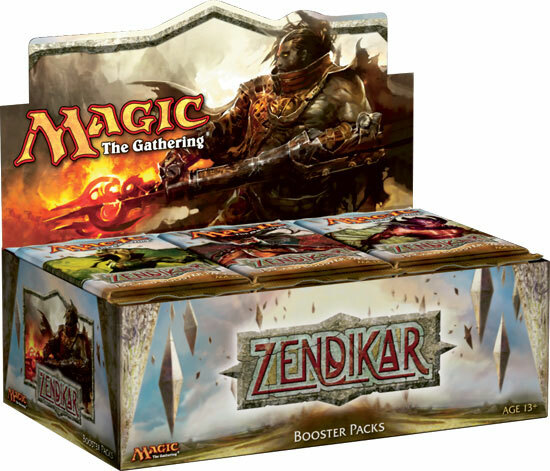 I circled back to the deck and after playing a number of match-ups discovered some of the weaknesses inherent in the deck. Against Counterpost I had issues muscling some of my key cards into play. The Mind Ravel and Mind Warp were decent at helping against that deck, but I felt I needed more disruption against the counter-magic. Against the creature decks my removal was a bit clunky and slow, and I had almost no answers against shroud creatures like Deadly Insect. I aimed to change this and scoured the block for answers. Black didn't offer much help here. Mind Ravel was already exhausted as an answer to permission magic. Stench of Decay was considered to take out the formidable Deadly Insect, but I finally decided to branch out further and just add a second color. 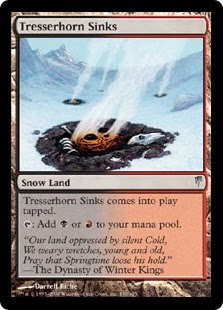 This variant of the deck doesn't change all that much in terms of actual card volume but it plugs a number of holes in the original. Now we have additional early game removal. Skred is added in addition to Contagion to remove just about any threat early or late game. What changes more notably is in the sideboard. Gone are the Mind Ravels. They are replaced with Pyroblast which better allows the Necro player to force though important spells. Pyroclasm is a very efficient answer to swarm decks and deals with troublesome shroud creatures the old deck couldn't otherwise deal with. I think this variant is of Necropotence is an improvement over the original. 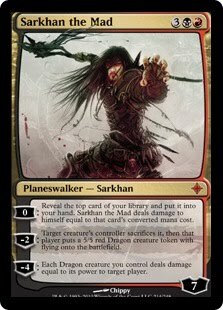 It still offers all of the card drawing life draining power of the original, but is more consistent in how it handles threats on the board, and can better stifle permission players as well. Shep and I decided to put play a quick 1500 point game recently. He used his Vostroyans. I brought Orks. I decided to go Mek today. The list is here. We obviously play for keeps around here. My experience with guard is that I have a chance if I can go first. We ended up with a pitched / annihilation game. I won the roll. I was happy about that but not thrilled with the mission since that meant I had to move towards him while he just had a turkey shoot from whatever edge he wanted. I had to put my lootas in area terrain to avoid the manticore indirect fire bypassing all cover saves. I did the same with kannonz. The wagons were placed in the middle with buggies trailing behind. Shep decided to just reserve everything. He outflanked with his vendettas. This is wise since he knows my list is capable of just blowing out almost all his firepower in a single turn if the rolls go my way. With nothing to shoot at I just reposition some of my infantry and move the wagons into the middle of the table. Shep rolled his reserves. He gets all 3 Vendettas, 1 Manticore and 2 Vet Chimeras. The Vendettas shoot into side armor on the nob wagon and stun it, another one picks off a buggy. The Manticore blasts the closest loota unit and kills a couple of them. A multi-laser kills a third. They fail morale and run off the table. 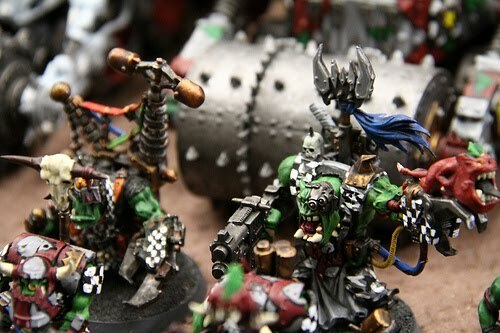 Finally the Orks have something to shoot at. One loota unit only has LOS to a chimera. They take a shot and destroy it. A second loota unit wiffs on a vendetta but the kannon unit blows it up instead. The buggy takes a rockitt shot at a vendetta and misses. Guard comes back with shooting. From reserve the second manticore, a veteran squad and CCS show up. A vendetta immobilizes the Nob Wagon and then the second Stuns the KFF Wagon. A Manticore blasts the kannonz and kills all the artillery, the grots run for it. Multilaser blows up a buggy rockitt rendering it useless. Remaining Lootas have a shot on a second manticore and miss. The second Loota unit wrecks another vendetta. The broken weapon buggy attempts to run away to not yield another kill point. A functioning buggy fires at a manticore and also misses. The last Manticore arrives from reserve and then all three send barrages at the orks. One wagon is blown up and 4 orks die in the explosion along with a nearby buggy. The running buggy is killed by a vendetta. More manticore fire shoots at the two remaining wagons and fail to hit or wound. The remaining mobile Battlewagon moves forward 13" and the Ork's debark in a desperate attempt to charge the vehicles and guardsmen in the blasted chimera. The other Boy unit from the blown up wagon moves forward 3" through difficult terrain in an effort to assault the nearby Manticore. The Boyz waagh and the first unit moves 2" and the second unit 1". Not good. The full unit still manages to assault a manticore and a chimera. The Manticore gets stunned and weapon destroyed. The chimera suffers no damage at all. With a failed assault and terrible run roll the remaining chimeras line up and template the Boyz into oblivion. The remaining infantry fail a morale test at LD 8, then fail the bosspole attempt and run away. The Deffrolla wagon has a chance to do some damage here on the following turn with a ram. Unfortunately the game ends and the Orks are down 7 kill points to 3. So my Orks lose pretty handily. I'm not sure how I could have improved the outcome. He reserved which hurt my shooting, and then I had to deal with too much vendetta fire early slowing down my ability to get into his lines. My Nob wagon was pretty much out of the fight the entire game. I considered just moving them out of their wagon but I figured they'd just get blasted with Manticore fire so I stayed put and didn't give up the KP. The game was pretty close up until the last turn when he got 3 kill points. A less than terrible run roll on my Waagh! could have made the game much closer. I'm going to stick with this list and chalk up my loss to a poor matchup. I'm sure there were some generalship errors somewhere in there too but nothing that was obvious to me. I can't beat every army in every game. I'll just keep testing with it and hope it can achieve better outcomes in different missions or against different army types.